Background: Inflammatory Bowel Disease (IBD), which includes Crohn’s disease (CD) and ulcerative colitis (UC), are chronic non specific inflammatory conditions. Standard IBD treatment typically employs a combination of anti-inflammatory and immune suppressive medications; however, the pharmacological approach is not by itself curative. The Anti-Inflammatory Diet for IBD (IBD-AID), which is derived and augmented from The Specific Carbohydrate Diet (SCD), is a nutritional regimen that restricts the intake of complex carbohydrates such as refined sugar, gluten-based grains, and certain starches from the diet. These carbohydrates are thought to provide a substrate for pro-inflammatory bacteria. The second component of the diet involves the ingestion of pre- and probiotics to help restore an anti inflammatory environment. 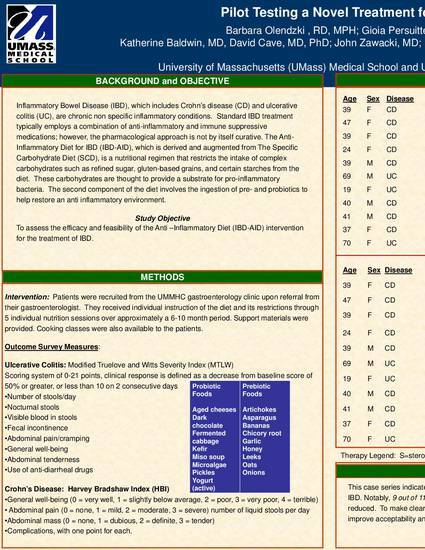 Study Objective: To assess the efficacy and feasibility of the Anti –Inflammatory Diet (IBD-AID) intervention for the treatment of IBD. Intervention: Patients were recruited from the UMMHC gastroenterology clinic upon referral from their gastroenterologist. They received individual instruction of the diet and its restrictions through 5 individual nutrition sessions over approximately a 6-10 month period. Support materials were provided. Cooking classes were also available to the patients. Conclusion: This case series indicates the potential for the IBD-AID to be used as an adjunctive or alternative therapy for the treatment of IBD. Notably, 9 out of 11 patients were able to be managed without anti-TNF therapy, and 100% of the patients had their symptoms reduced. To make clear recommendations for its use in clinical practice, randomized trials are needed alongside strategies to improve acceptability and compliance with the IBD-AID.